* Weight loss results may vary. This is not a guarantee! Amelia-Grace has an incredible story to tell. 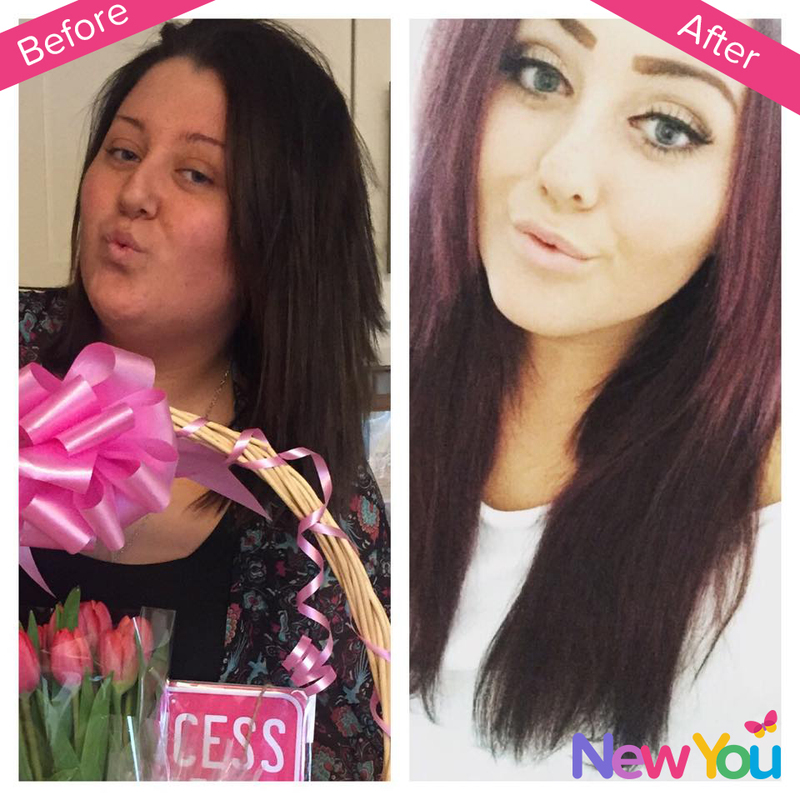 Her New You Plan journey really is inspirational… in just 8 short weeks, she has lost 4 stone! That’s 2 stone per month! She truly shows that if you stick to the plan 100%, amazing results are achievable! Read her interview below as she shares her reasons for getting started and how the Plan has changed her life! So Amelia Grace… tell us, how much weight have you lost! I have lost 4 stone in 8 weeks on the New You Plan. I started off as a size 22/24 and I’m now wearing size 16 on my bottom half and 12/14 on my top half! Tell us when you started the plan? What was it that finally led you to getting started? I was getting changed and I only had my underwear on, and I caught a look at myself and I was trying to convince myself it was definitely just a bad angle. But it wasn’t, it was me and I realised I’ve been in complete denial about how big I actually was, and how unhealthy I was. Only now do I realise how unhappy I was. How has The New You Plan has changed your life? This Plan has made me a completely different person inside and out. I’m unrecognizable in the terms of my looks, and I’m so so so much happier in myself. This plan has made me feel human, and given me self worth. It really has changed me for the better. Is there a particular of piece of clothing that you’ve been dying to wear? I absolutely love those fitted bodycon dresses. I would love to eventually be able to go on a night out in one of those and be confident in it! Our customers love the support from Secret Slimmers. Have you got in on the action? Yes! The page is lovely to share your story with and to hear how others have succeeded. Everyone is really supportive, which helps get you through the harder times! I hope you’ve found great support in our customer service team? Tell us, what New You Plan meals and snacks can you not live without? Spicy Noodle Nosh! I can’t go a day without it! I also love the Chicken Noodle Curry! They are my all time faves. Have you tried any of our Water Flavourings? Which is your favourite? Yes, I’ve had the Orange Zest and Berry Blast. I can’t really choose a favourite as it depends what mood I’m in and what I fancy! They’re both so tasty! Do you have any tips for staying on track? How did you stop yourself blipping? In my opinion, you’ve got to want it 200% to succeed. There’s no point messing around or being good for a couple of days and then having a massive blip. If you want it enough you won’t blip! You’ll find a way to stop yourself. I did think about giving up a couple of times but then all my hard work would have been worth absolutely nothing – nothing at all! If you want to blip, you’ll blip. If you want to do well and you’re 100% focused, you’ll stay on track! Simple. We hear all the time about the amount of energy our customers have on the plan. Has this had an impact on your exercise? I’ve actually just joined the gym this week so I know all the extra energy will come in useful! I’m on my feet all day and I’m already finding it easier! To lose another stone or so. I also plan that when I go onto refeed that I continue to have the will power and determination this plan has given me. I’m sure there are loads of people reading this who just haven’t taken that leap of faith yet. What advice would you give anyone considering starting their New You journey? The thing is only you know how you feel! Are you happy with what’s staring back at you? Are you happy within yourself? Those are the main questions. As my weight was ruling my life, it stopped me from going out and living my life! You can’t let it hold you back, because life is too short. But you have to do it for YOU. No one else but YOU and only YOU. If like Amelia-Grace, you want to start dropping dress sizes, shop our 6 Week Summer Slim Down Bundle HERE today! Join Julz in really making the next 6 weeks count and embark on this journey to a brand New You together! With this amazing 6 Week Bundle, you’ll receive a total of 28 meals and 2 snacks per week (that’s 168 meals and 12 snacks in total), for the discounted price of just £199.99, saving you a phenomenal 64%. That’s the small price of just £4.76 per day! You’ll also receive access to our online coaching section, which includes access to all our amazing videos! What’s more, with this bundle you’ll receive motivation like never before! Purchase today and get your 6 week downloadable manual to keep record of your amazing weight loss. What’s more, EVERY DAY for the next 6 weeks, you will receive a motivational video from Julz, straight to your inbox, the perfect way to kick start each brand new day! Julz will be there with you every step of the way so you can take part in this journey together! BONUS PRIZE DRAW… WIN A £400 SHOPPING VOUCHER! PLUS… Update your weekly weight in results on our blog and your name will be entered into a prize draw to win a £400 shopping voucher in September, perfect for shopping and buying clothes in 1-2 dress sizes smaller!